The acclaimed songwriting podcast, And The Writer Is…, returns for a second season, featuring a special country week with Thomas Rhett, busbee, Nicolle Galyon, Ashley Gorley and Zach Crowell. The season—which debuts new, hour-long episodes every Tuesday—will additionally feature a lineup including the NMPA’s David Israelite, Jack Antonoff, Babyface, Charlie Puth, Julia Michaels, Claude Kelly, Dan Wilson, Sir Nolan, Lindy Robbins and Mike Posner. 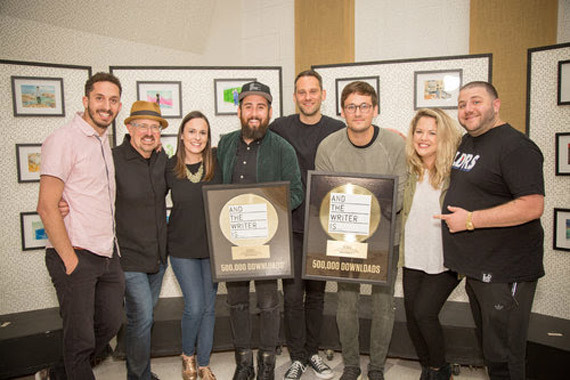 A celebration was held Sept. 27 at the Sound City Studio in Van Nuys, California before hundreds of songwriters and music industry executives and Big Deal Music Group partners. And The Writer Is… host Ross Golan and co-producer Joe London announced the lineup of the new season—which launched earlier that day with Golan’s interview with Antonoff, who recently penned hits for Taylor Swift, Lorde, St. Vincent and his own band Bleachers. Gold plaques were presented in commemoration of the podcast’s first season exceeding 500,000 downloads. Stream or download new episodes at andthewriteris.com, iHeartRadio, iTunes, Spotify and other podcast platforms.